The holiday party season is here! This is the second post in our series of holiday dinner ideas. In today's post, I'll share a glimpse into healthy holiday catering from Taziki's Mediterranean Cafe. This restaurant is fantastic because they offer the perfect mix of health and good taste. Your guests will appreciate the healthy and nutrient dense food options that stand out as truly special during the holiday season. As we share the menu items that we recommend, pay close attention to the colorful ingredients that are prepared in a healthy Mediterranean style without butter or questionable additives. Let's start with the basics before I tell you about our favorite food items. Taziki's Mediterranean Cafe has several locations, including two in the DFW metro - Southlake and Plano. We've enjoyed many visits to the Southlake location over the years as it is one of our favorite restaurants. Taziki's is also well known for their family-style take-out dinners for families of four. (Their family take-out dinners have been a lifesaver on many busy evenings when I didn't have time to make dinner!) Today, we'll focus on catering. First, you'll want to visit their catering page here. The catering menus are easy to browse online. You may place your order online or over the phone. You may pickup your order or they will deliver it. (Be sure to give a minimum of 24 hours notice for delivery. I recommend extra time if your order is extremely large.) Their customer service is top notch. They are truly dedicated to providing excellent catering. If you have a question or concern at any time, they even have a dedicated support hotline! In our personal experience, the manager seemed like a perfectionist who paid close attention to every detail throughout the entire process. Now, let me share examples of our favorite menu items. You'll notice a trend of colorful veggies and the combinatorial explosion of possibilities to create a well balanced meal that is packed with nutrients. The Taziki Dip is made from Greek yogurt, cucumber, dill, and a hint of lemon. This dip stands out because it is fresh and they shred the cucumber for a nice texture and taste. We served it with their soft pita bread on the plate below. The Hummus Trias is my personal favorite, especially when served with their baked pita chips that have delicious seasoning. The Hummus Trias includes their signature hummus in three varieties - Original, Basil Pesto, and Rustic Tomato. They provide three containers of the original hummus and then two small containers with the remaining ingredients for Basil Pesto and Rustic Tomato so that you are able to mix them just before you serve the hummus. Let me show a closer view of the Original Hummus because their combination of ingredients is perfect. You'll notice the texture below. This is a closer view of the Pesto Hummus. This was one of the most popular items at our holiday party. This is the Rustic Tomato Hummus. This was also popular and disappeared quickly! The Grilled Chicken Roll-Ups are a great option for holiday parties. They contain grilled chicken with tomato and feta in a grilled flour tortilla. Your guests will love that they cut these into smaller portions so that it's easy to sample a little bit of everything at your holiday party. Many of our guests also loved adding the Pesto Hummus to these trendy roll-ups. Let's move on to the entrees. You will notice that they are surrounded with colorful veggies. This is a highlight of the meal. As I mentioned earlier, there is a combinatorial explosion in the number of ways to combine fresh veggies into a nutrient packed meal! This is a great way to offer healthy options to guests. The Greek Salad is served with fresh mixed lettuces, tomatoes, cucumbers, roasted red peppers, red onions, feta, pepperoncini, kalamata olives, and a special Greek dressing. Everyone raved about this healthy option and that the dressing is fantastic! The Taziki's Signature Pasta is another popular catering item. This includes penne pasta and grilled chicken, tossed in their iconic homemade Balsamic Vinaigrette and topped with tomatoes, feta, and fresh basil. We noticed that they are generous with the ratio of grilled chicken so that this is packed with protein. This is perfect for holiday parties because the Balsamic Vinaigrette is unique and this stands out as a memorable dish. Finally, the Beef Tender is my personal favorite. The chefs are perfectionists as they use good quality beef and season and chargrill it to perfection. Some of our guests ate the beef with the delicious Basmati Rice. Others added it to salad or even dipped it in hummus or Taziki Dip. You will definitely want to include the Beef Tender in your holiday order. 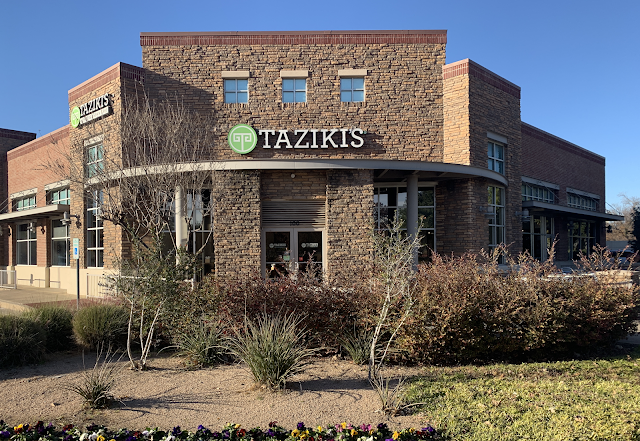 In summary, Taziki's Mediterranean Cafe is perfect for health conscious holiday parties where you want to impress guests and provide them with nutritious dinner options. We featured our favorite items, but Taziki's also has a larger menu that you will find on their website. We loved working with them because they are very focused on quality and excellent customer service. They made it easy for us to throw a holiday party with very little effort on our end since they took care of the most important details -- the perfect food! We love that guests raved about the food at our holiday party. Visit Taziki's here.